Consistently ranked as one of the top schools in the country, Northwestern’s scenic campus is located on Lake Michigan in the city of Evanston. Many feel it’s the ideal combination of college town meets city living, but be warned it helps if you don’t mind some cold weather. Chicago is affectionately known as the Windy City, and the gusts coming off the Lake can be quite fierce. While Evanston has everything, you need right there, the city of Chicago is a mere 14 miles away—a short “L” ride or a 30-minute drive depending on the traffic. Transportation: Chicago has two airports: O'Hare International and Midway. O'Hare is located about a half hour outside of downtown Chicago (13 miles) and Midway is near the Southwest Side of Chicago, about a 50-minute drive from campus (30 miles). Staying downtown? The Evanston campus is on the CTA Purple Line and is close to the Davis, Foster and Noyes stops. Traveling by train, Amtrak operates out of Chicago’s Union Station. Stay: Just a few blocks away from campus in downtown Evanston there are three convenient options: the Hilton Orrington, the Hilton Garden Inn and the one-year-old Hyatt House Evanston. If you decide to make a weekend out of your visit, consider one of the hotels in downtown Chicago, a straight shot from Evanston down Lake Shore Drive. Some of our favorites include the luxurious Peninsula or the boutique properties of the Thompson, Hotel Lincoln, and the Public Chicago. On a recent visit we loved the vibe and décor at the very chic yet welcoming Soho House, our new favorite place to stay in Chicago. Though it’s a little father from Evanston, located in the West Loop, we highly recommend it. Coffee: Students head to the Unicorn Café, for their morning caffeine fix, a long time student favorite. Starbucks has a branch right on Sherman Street and another location on campus in the Norris Center. Better yet, grab a cold brew on your way to the tour at the student-run mobile vendor Brew Bike (weather dependent) right by “the Rock” in front of Kresage hall. Brew Bike also has a permanent new storefront location at Annenberg Hall. Breakfast: A new (ish) addition to Evanston and already a Wildcat favorite is, Cupitol. You’re going to love Prairie Joe's a 5-10 minute drive from campus on Central Street. The menu offers American comfort food with a Mexican influence all served in a kitschy, funky room. If you are visiting on the weekend, try the brunch at The Peckish Pig. Fans of fresh juice will want to try Peeled Juice Bar. Lunch: On campus in the dazzling new Kellogg School of Management enjoy lunch at The Marketplace at Global Hub. This state of the art center is a student gathering space with beautiful lake views—it’s a must see during your visit. Chicago is famous for deep-dish pizza and Lou Malnati’s and Giordano’s, two local chains, are represented in Evanston. A few Northeasterners we spoke to admit they’re not fans of deep dish and instead tell us to try Blaze. “At any time of day, you’ll see tons of Northwestern kids hanging-out inside.” Soulwich has crazy good Asian fusion sandwiches, but it’s more of a takeout with just a few tables. Rushing to the airport? Grab a smoked turkey sandwich and a homemade chocolate chip cookie to go at classic Al's Deli or a taco at Tomato Fresh. Over on Central Street, (about a 5 minute car ride) student’s eat healthy at Foodstuffs, a gourmet market with a few tables—pick your ingredients and a dressing from the extensive offerings on the salad bar and the staff will chop it for you. Heading north from campus, just a quick 5-minute drive, locals rave about the comfort food at Lucky Platter. In the middle of winter, chicken pot pie, tuna melts, and Caribbean pumpkin soup are a welcome respite in addition to salads, pizzas, and burgers. (We hear the Yankee pot roast and fried chicken are popular at dinner.) If there’s a vegetarian in your group, they will be happy if you choose to dine at Blind Faith Café. Casual: Union Pizzeria is the spot for great pizza and a cool atmosphere. Edzo's Burgers is everyone's favorite for burgers and shakes. The Celtic Knot is an Irish pub offering authentic Irish fare. The menu is extensive - try Shepherd's pie, corned beef, and cabbage or fish and chips. For authentic ramen, grab a seat at Table of Stix. A Step Up: Restaurateur Amy Morton has quite the food pedigree; her dad’s the guy who founded the famous steakhouse Morton’s, and she is undoubtedly following in his footsteps with two of the top restaurants in Evanston: Found Kitchen and Social House and The Barn. Found is a homey place, designed to feel like you’re dining in your living room featuring a locally sourced menu of seasonal small plates. Make reservations in advance, as it’s always busy! The Barn is a hip hideaway, nestled down a back alley inside a 19th-century building that was once a horse stable. The menu is meat-centric served in a bi-level space, also with excellent cocktails. Other great Evanston choices include Campagnola, Boltwood, The Stained Glass and its more affordable sibling The Cellar at the Stained Glass. Sweets: Everything is handmade in house at Hoosier Mama Pie Company; stop in for a slice of sweet pie and some coffee from Dollop Coffee Co.
Bring it Home: Over on Central Street stop in at The Spice House, where the staff is super friendly offering tons of suggestions and favorite cooking tips. After sampling quite a few blends we left with jars of different spices to jazz up our summer BBQ’s. The Spice House has wonderful gift boxes with blends, inspired and named after different Chicago ethnic neighborhoods-a great gift for your foodie friends! Chalk, a high-end fashion boutique, is around the corner and worth a quick browse. If you have time at the airport, get a bag of Chicago's famous Garrett popcorn. Local Attractions: The Block Museum is well worth a visit, the galleries change periodically and it’s always packed with students. It’s located near the student center, a good stop to get a sense of campus life. 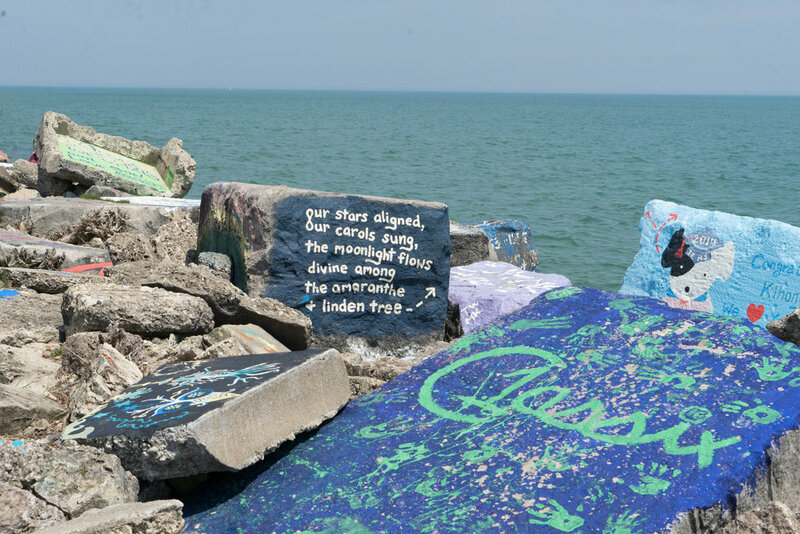 Weather permitting stroll the lakeside, checking out all the painted rocks with exclamations ranging from Class of '97 to Cathy-- marry me to Graduation Night '89. Chicago is a world class city, and a big part of student life. Just toured the Northwestern University Campus? Are you a Northwestern student, parent or Alumni? Fill out this 2 minute survey to supplement our Daytripper University Guide for Northwestern University!